The Water Key fully supports and encourages others to start taking steps toward reducing the potential health risks associated with toxin-leaching plastic by purchasing high-quality, non-leaching reusable bottles. By using the brands mentioned below, we will also greatly help reduce unnecessary environmental waste caused by plastic PET water bottles. Unfortunately, Americans add over 30 million plastic water bottles to our nation's landfills – every day! Aquasana® has been the #1 rated home water filtration system in America and was voted "Best Buy" by Consumers Digest Magazine for six years in a row, from 2003 to 2008. They now offer 750ml Designer Glass Bottles that come in a package of 6. Frigoverre™ is a favorite in Europe for its sturdy, yet stylish glass storage components. It’s also a favorite at The Water Key, for it allows us to mix and store whatever beverage we want in our refrigerator, without worrying about anything leaching into it. Eco-Friendly Water Bottles include stainless steel water bottles such as SIGG™ and Klean Kanteen, which deliver high quality, reusable stainless-steel bottles with both function AND fashion! They have a range of styles and sizes – from colorful Kids bottles to travel mugs, sippy cups and thermal one-liter size containers. For more brands, styles and sizes click here. KOR writes: "We believe passionately in the importance of clean water to human health and to the health of our planet, and in the power of design to inspire and motivate." They also donate 1% of sales to non-profits focusing on water related issues. "Our goal is not only to provide much-needed funds to these organizations, but to engage customers on issues such as recycling, sustainable water use, watershed protection and the global water crisis." Over one hundred styles to choose from including some of the best brands in the industry. These high quality reusable bottles are safe, BPA-free and recyclable. When you choose from safe plastic, safe aluminum, and stainless steel bottles, you will help reduce wasteful consumption of disposable beverage bottles. These will save you money while saving precious, natural resources by reducing the trillions of cans and bottles thrown away each year. Every time you purchase a KOR One, you are donating to select non-profits that focus on water-related issues. Kor’s goal is not only to provide much-needed funds to these organizations, but to engage its customers on issues such as ocean protection, recycling, watershed protection and the global water crisis. Each one of the four KOR One Hydration Vessels represents one of these specific water-related causes. The very best way to keep water pure and fresh is to bottle your own in glass containers. 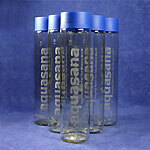 750ml Designer Glass Bottles come in a package Of 6. Get 1 FREE Aquasana Glass Water Decanter when you purchase the Aquasana Drinking Water System or the Aquasana Combo-Pack: Drinking Water Filter and Shower Filter! Glass Pitcher - 72 oz. Glass Pitcher - 40 oz. Glass Samoa Pitcher - 2.75 qt.